The project covers a porphyry-skarn gold-copper-silver-moly zone related to a >5 km diameter granodiorite stock that has in turn been intruded by a quartz-feldspar porphyry. Drilling results to date include 92 m grading 0.31% Cu, 0.012% Mo and 5.1 g Ag/t, 184 m grading 0.20% Cu, 0.013% Mo and 1.6 g Ag/t, and 12 m grading 3.94 g Au/t. In an adjacent historic silver district samples returned up to 1m grading 765g Ag/t. Minas Año Tres Mil (MATM) is looking for an organization to continue work on this early stage exploration property. The Rodeo project is located in the state of Michoacan, Mexico, some 215 km southwest of Mexico City, in the Guerrero-Michoacan copper belt. The Guerrero-Michoacan copper belt is a >200 km long belt of intrusion related copper and gold occurrences which includes the Guerrero gold belt. A >5 km diameter Tertiary(?) granodiorite(?) and quartz-feldspar porphyry stock intrudes Cretaceous(?) andesites, andesitic sedimentary rocks, and limestones. There is an approximately 3 square km. area of potassic alteration around the quartz-feldspar porphyry within a 2 x 5 km zone of silicic alteration. 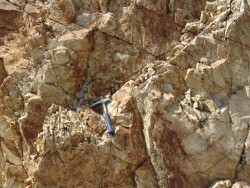 Over approximately a 3 km diameter area a weak gossan is exposed where the quartz-feldspar porphyry and granodiorite have been weakly pyritized and sericitized. Prograde(?) garnet-diopside-magnetite endoskarns and retrograde(?) contact skarns are respectively found within the granodiorite and on or near its contacts with the intruded limestones. 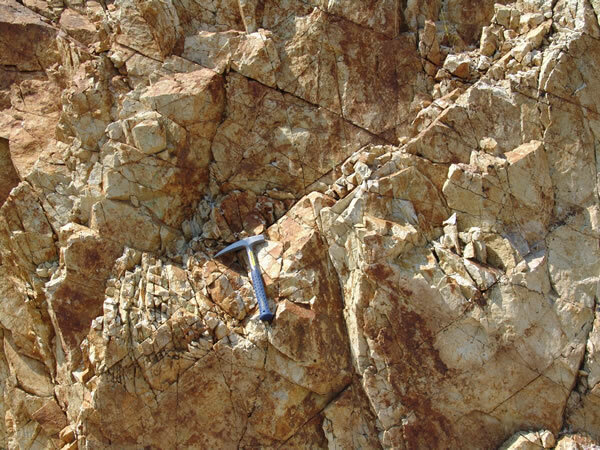 Mineralization in the quartz-feldspar porphyry consists of stockworks with K-feldspar and secondary biotite filled fractures along with pyrite and occasional chalcopyrite, and disseminated pyrite and occasional chalcopyrite. Surface samples in this area run from a few 100 to few thousand ppm Cu with up to 1,300 ppm Mo and sporadic Au. Trenches in this area returned 114.0 m grading 0.20% Cu, 0.004% Mo and 1.0 g Ag/t, and 90.0 m grading 0.44% Cu, 0.045% Mo and 3.4 g Ag/t. Trenches in the garnet-pyroxene-magnetite endoskarn has yielded up to 30.0 m grading 1.8g Au/t, 1% Cu, 25g Ag/t and 0.05% Mo. Trenches in a contact skarn returned up to 93.0 m grading 1.2g Au/t and 3.9g Ag/t. The true widths are probably less. Results from the IP survey show some strongly anomalous areas that have not yet been tested by drilling. Mining in the district reportedly began prior to the arrival of the Spanish, who established the district in 1529. 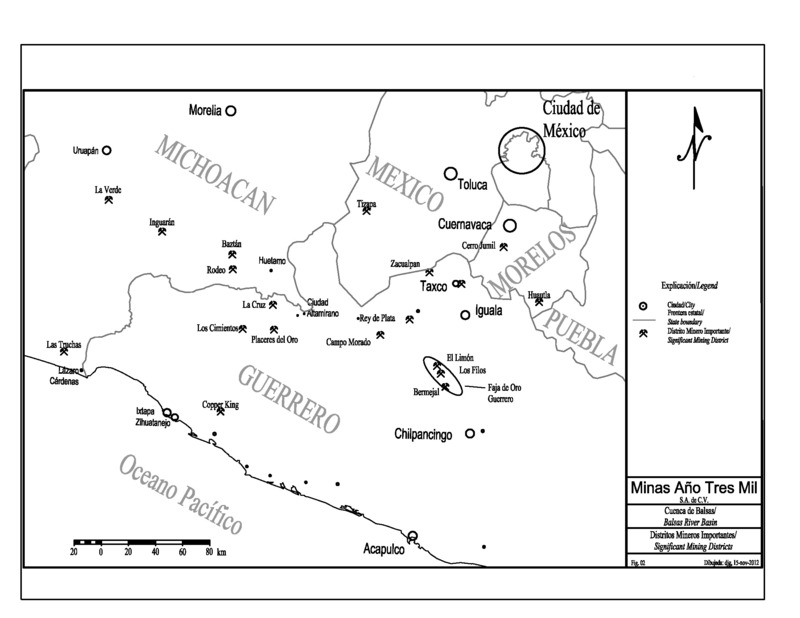 The Spanish were primarily interested in silver and there were several small camps within the district, in what is now known to be a propylitic alteration zone. For a short period of time Real de Espiritu Santo, the largest of these camps, was reportedly the territorial capital. Recursos Cruz del Sur (RCS) became interested in the area in 1997 when the government released the stream sediment data for the area, and a typical porphyry copper signature was recognized in the data. RCS successfully consolidated the district and in 2007 optioned the property to a subsidiary of Global Resources Corp. of Australia. This agreement is being terminated by mutual consent and the property is being transferred to MATM. Over US$3,600,000 has been spent to date on the project.